Physics Buzz: Nerd on your gift list? Give a Gömböc! We buy pet rocks, snuggies, and shrinky-dinks; mathematicians have Klein bottles, Mobius strips, and the ultimate mathematical novelty item, the Gömböc. Gömb means "sphere" in Hungarian, but the Gömböc is an extraordinary shape all its own (and is apparently pronounced "goemboets"). As QI host Stephen Fry demonstrates in the video above, no matter how you set it down, the Gömböc will wobble and rock itself right side up. And, unlike the common Weeble, the amazing Gömböc isn't weighted. It rights itself thanks to its unusual geometry. The story of the Gömböc begins the way many mathematical tales do—with an older cannier mathematician posing a really hard problem. Mathematicians knew that it was impossible for any two-dimensional object to have just one stable equilibrium point (like the curved bottom of a round bowl) and one unstable equilibrium point (the tip of a pencil, for instance). But Vladimir Arnold, a Russian mathematician, wondered whether this was also impossible for three-dimensional objects. The question sent Hungarian mathematicians Gábor Domokos and Péter Varkonyi on a swashbuckling hunt for such a monomonostatic (one stable, one unstable equilibrium point), homogeneous, convex object. That is, a three-dimensional object, uniform in substance, without any inward bulges or weights, that always righted itself no matter how you set it down. Domokos and Varkonyi quickly realized that it was easy to add an equilibrium point to any 3-d shape. So working backwards, there should be a sort of fundamental shape from which all others could be grown. The realization gave them hope, but finding the real thing cost the pair blood, sweat, and tears. And pebbles. (Domokos once hijacked his and his wife's vacation to a Greek island and turned it into a wild monomonostatic object chase, searching for the shape among 2,000 of the beach's pebbles.) But the enterprising mathematicians finally found a way to construct the elusive shape by mathematically tinkering with a sphere. As if to add insult to injury, the Gömböc hunters realized that someone else had been making the shapes for millions of years, for free. 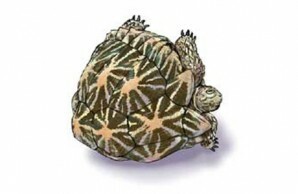 Nature, in all her cunning, gave the India star tortoise a Gömböc-like shell so that it could right itself. While it works on rather slower timescales than does mathematical derring-do, evolution too can produce mathematical gems. Look, even Cambridge has got one! Given the trials and tribulations Domokos and Varkonyi overcame to finally construct the monomonostatic object, it makes sense that they'd want some payback. They've set up a company that makes Gömböcs from aluminum alloy, plexiglass, and brass. While the cheapest, the aluminum, will set you back about $220, it's not exactly overpriced given that the object's dimensions can deviate by just one hundredth of a millimeter. The items seem to be all the rage—Cambridge just received one! So please, do a favor to poor, pebble-counting Mrs. Domokos, and the next time you've got a deep nerd on your gift list, give a Gömböc.